Six General Army have been killed in the incident. They are General Ahmad Yani, Major General M. T. Haryono and Brigadier General D. I. D. i. Panjaitan) were killed at their homes, while three more (Major General Soeprapto, Major General's. S. Parman and Brigadier General Sutoyo). Late in the evening on Sept. 30, 1965, a group of army conspirators calling itself the September 30th Movement gathered in Jakarta with the aim of kidnapping and killing seven army generals in the early hours of the following morning. By dawn on Oct. 1, six of the generals were dead; the seventh, Abdul Nasution, had escaped. But, her daughter Ade Irma Suryani was killed in the unfortunate incident. They were brought to Lubang Buaya. Lubang Buaya is located in the south Air base Halim Perdana Kusuma. They were taken into the pit elders. "The Thirtieth of September Movement” (Indonesian: Gerakan 30 September, abbreviated as G30S or Gestok, for Gerakan satu Oktober, First of October Movement) was a self-proclaimed organization of Indonesian National Armed Forces members who, in the early hours of 1 October 1965, assassinated six Indonesian Army generals in an abortive coup d'état. Later that morning, the organization declared that it was in control of media and communication outlets and had taken President Sukarno under its protection. By the end of the day, the coup attempt had failed in Jakarta at least. Meanwhile in central Java there was an attempt to take control over an army division and several cities. By the time this rebellion was put down, two more senior officers were dead. inhabited Operational held on October 1, 1965. The operation was led by Major General Soeharto. Operation was carried out late afternoon. The troops RPKAD under the Sarwo Edhi Wibowo succeeded in taking back RRI, center of communication Indonesia. Maj. Soeharto announced that there had been kidnapping and killing six officers, in Indonesia. While President Sukarno in the state safe and healthy. The community is expected to remain calm and cautious. Next, the Air base RPKAD succeeded in obtaining Halim Perdana Kusuma. Then, a day after The troops RPKAD succeeded in finding on the sixth general who was killed in Lubang Buaya. 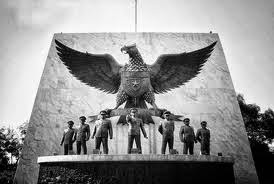 Pancasila as an ideology of which is maintained. Communist ideology is not being applied successfully in Indonesia. Under the "New Order" regime of President Suharto the movement was usually referred to as "G30S/PKI" by those wanting to associate it with the PKI, and propaganda would refer to the group as Gestapu (for its similarity to "Gestapo", the name of the Nazi secret police). Since then, each on October 1 always be remembered as the "Hari Kesaktian Pancasila". 0 Response to "On this day, The Thirtieth of September Movement"